Wedding reception or Film set? Wedding videography has come along way since the old VHS, block like camera which would require two people to place onto the cameraman’s shoulder! 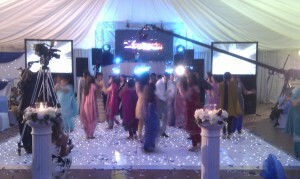 This wedding in Slough Centre made use of a camera fixed to a crane which you can see on the right of the picture, to capture all the special wedding moments: very impressive. Entertainment: DJ Jatty, Calibar Roadshow.